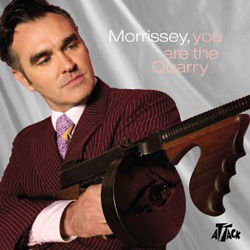 The bonus material found on this Deluxe edition includes the nine b-sides from the "Irish Blood, English Heart", "First Of The Gang To Die" and "Let Me Kiss You" singles, the video for "Irish Blood, English Heart", video files of "First Of The Gang To Die", "I Have Forgiven Jesus" and "Let Me Kiss You" live on USA television programme the Late Late Show (with Craig Kilborn) and a 32-picture photo gallery. The European edition has the regular album on one cd and all the bonus material on a separate enhanced cd. 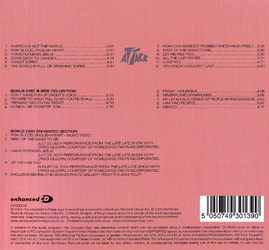 The American edition has all 21 songs on one cd and the video material on a bonus DVD, including the additional video for "First Of The Gang To Die" which is not on the European version. View information about this album's original edition here. Silver version of the artwork used on the original edition. Photo by Greg Gorman. Highest charting position in UK: ?? Highest charting position in USA: ?? It seems like this edition of the album was not promoted.